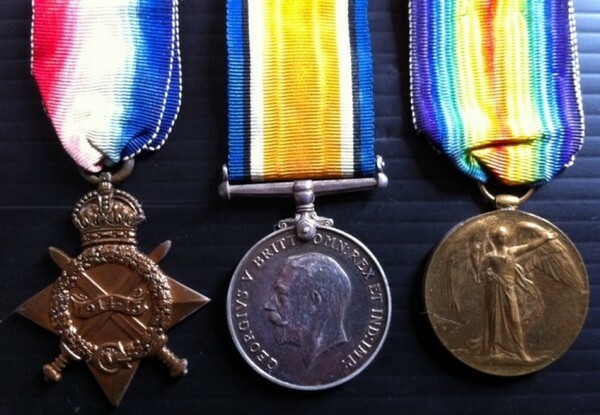 An EX-RARE 1914-1915 STAR TRIO TO THE ROYAL FLYING CORPS. 2. A.M. F. R. ELLIOTT. R.F.C. There were only 25 Special Reservists in the RFC at the outbreak of WW1. These men were mostly tradesmen who already possessed or had trained in a special skill which was relevant to the new field of aviation. Elliott was a rubber Vulcaniser and would be a highly useful airman when it came to mending balloons and or burst tyres ! He was thus quickly recalled for service on 11th August 1914 with No1 Squadron and served overseas from 3rd March 1915. Promoted Sgt on 1st November 1917. Born in Chiswick, London. Service papers state, “Promoted 2/Lt in D/W Yorks”. Of the 25 Special Reserve Groups issued ONLY TWO groups are known to survive intact ...........This is one of them !